Milton just keeps dropping tennis balls wherever he so pleases. 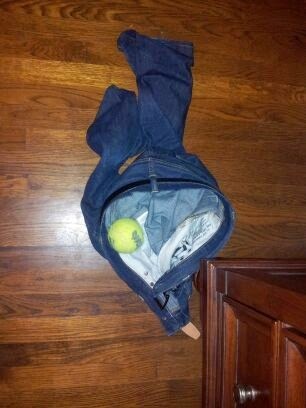 This tennis ball placement appears to be quite intentional because as soon as Jeff goes to put on his jeans, what will he see -- Milton's tennis ball! Then almost immediately Jeff's mind should make the connection of, Huh, I think I should go play ball with Milt. Our little Milton is one smart cookie. You picked him out, Momeaux -- well done!